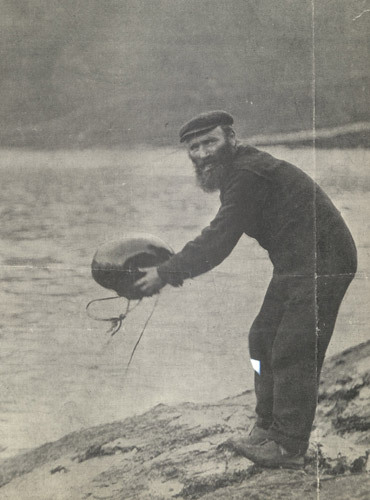 By the late 1890s a unique system of mail dispatch had developed on the remote Scottish islands of St Kilda: letters were enclosed in a waterproof receptacle attached to a homemade buoy or buoyant object and launched into the sea in the hope that they would wash ashore and be forwarded on by whoever chanced upon them. …in a waterproof, buoyant case and cast upon the waters. Usually this remarkable mail-packet is picked up on the coast of Norway, to be forwarded later to the Foreign Office. Four packages out of six reach their destination. 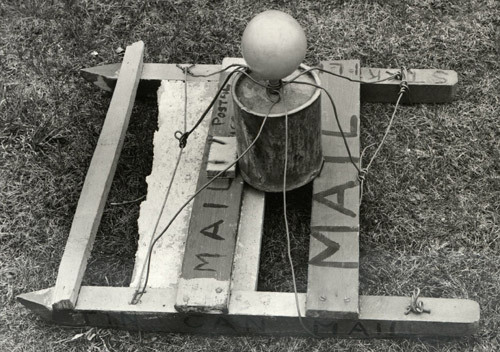 The St Kilda islanders constructed many types of mail boats using the materials they had to hand. 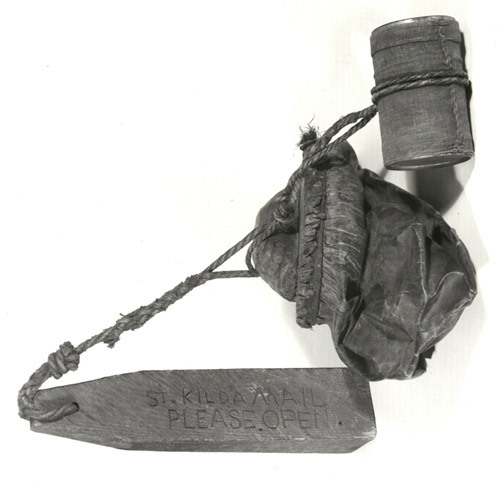 The letters and coins might be placed in bottles, cocoa tins or leather bags – any container that was waterproof – while the waterproof container would be attached to something that would survive the journey, such as a wooden vessel, a hollowed log or a buoy made from an inflated sheepskin. A St Kilda “mail boat”. There was picked up on St Ninian’s Isle Dunrossness, a St Kilda mail bag. The ‘bag’ is that usually employed by the St Kildians to communicate with the outside world, consisting of a sheepskin bag inflated to which was attached a tin canister, wrapped round with cotton wool, and covered with cotton sewn around it end tarred, the served with stout twine. The bag was forwarded to Lerwick Post Office. The tin was found to contain two letters and eight postcards, which were duly forwarded to their destination. A shilling was also enclosed. The bag had been sent off on 21st June so that it had taken two months and one day between St Kilda and Shetland. Another type of St Kilda “mail boat”. The mail boats weren’t just used by the islanders, tourists who came to St Kilda by steamer in the summer months would make a mail boat as part of the St Kilda experience. But for the locals the boats were more than a novelty, they were the best available option. According to files held in the Royal Mail Archive the General Post Office investigated establishing a regular mail service to improve communications between the islands and the mainland – one suggestion was to pay local fishing vessels to deliver and collect mail – but it was found to be too difficult to establish a regular service via these means. A sub post office was established on St Kilda in 1900 and by 1906 steam trawlers which visited the area were able to bring mail as often as six times a year, but the islanders still needed to use the mail boats. The ultimate problem for the GPO was that the small population on the islands did not justify the effort of establishing a regular service. Considerable efforts were made in the early 20th Century, but the First World War had a big impact on the islands: not only did the population decline as a result of men going off to fight, but the islanders’ expectations increase as communications technology improved. After the war, more efforts were made to secure a regular mail service but by 1928 the population had declined to 37 and in 1930 the remaining residents were evacuated the mainline. A final mail boat was sent before the islanders left for good and three months later it landed in Norway. St Kilda is now a UNESCO World Heritage site cared for by The National Trust for Scotland, Scottish Natural Heritage and the Ministry of Defence. Tourists visiting St Kilda still send mail boats as the St Kilda Ranger’s diary reported in 2011. This entry was posted in Archive, Postal History and tagged General Post Office, GPO, John Sands, mail boats, Post Office, Royal Mail Archive, Scotland, St Kilda. Bookmark the permalink. Reblogged this on Wandering & Wondering.